No extra Alexa Skills required. Works directly with Alexa in local network. This is a dead-simple node for adding Alexa capability to your NodeRED flow. NO complicated parameters, it just works. Does it support German or other languages? Yes! As long as Alexa supports that language. Do I need to enable any Alexa Skils? No. Nah. Non. Nein. Never. Is this free forever? Yes. We won't charge you anything. If you wants to help us out, buy us some coffee or RedBull. 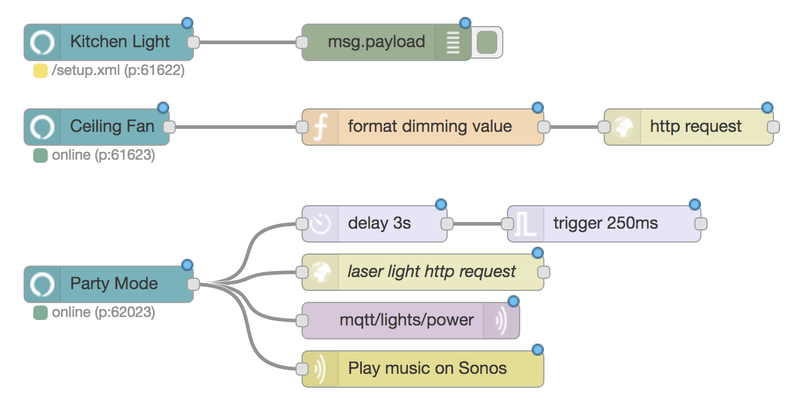 How do I control my (non-smart) devices at home with NodeRED? Check out RMPlugin app developed by us. Here's an intro video for the hardware.